DENVER--(BUSINESS WIRE)--Rise Broadband is the new brand name for JAB Broadband - the nation’s leading fixed wireless Internet service provider - and its five divisions which offer Internet and phone service to rural and suburban areas throughout 15 states in the Midwest, Rocky Mountain and Southwest regions. Formerly operating as Digis, Rhino Communications, Skybeam, Prairie iNet and T6, the Rise brand solidifies and unifies the company’s commitment of delivering high-speed, affordable Internet and digital phone service to nearly 200,000 residential and commercial customers. Since incorporating in 2005, the company has acquired 108 fixed wireless Internet service providers and now has 800 employees helping close the digital divide throughout Rise Broadband’s rural and suburban service area. 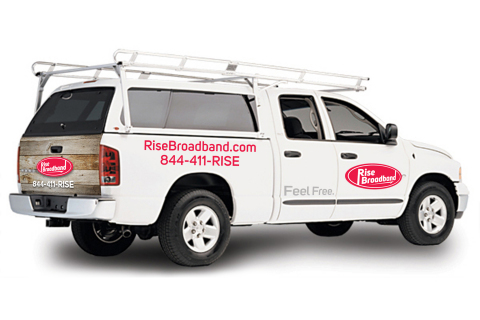 Rise Broadband is the nation’s largest fixed wireless Internet provider; serving nearly 200,000 rural and suburban residential and commercial accounts in the Midwest, Rocky Mountain and Southwest regions. Parent company JAB Broadband was incorporated in 2005 and previously operated as Digis, Prairie-iNet, Skybeam, T6 and Rhino Communications throughout 15 states; offering affordable high-speed broadband (Internet and phone) services with speeds ranging between 3 Mbps and 1 Gbps. Rise Broadband is headquartered in metro Denver. For more information, visit www.risebroadband.com.